Update: Declaration of Allotment List of the Actual Admission Round-1 to be declared today at www.gujdiploma.nic.in or www.acpdc.in as per Revised Schedule of Diploma Admission 2018-19. Candidate can do Deposition of Tuition Fees in the Bank and Online for confirmation of allotted Admission from 29th June 18 to 3rd July 2018. Provisional Merit List of Diploma Admission 2018 declared today on www.gujdiploma.nic.in. Choice Filling for Mock Round of Admission in Diploma College will also started today at Gujdiploma.nic.in & www.acpdc.in. Applicant Can check Their Provisional Merit Number and Merit Marks by Entering their Registration Number and PIN at gujdiploma.nic.in. Also Candidate Download Merit List (After 10th SSC) PDF From Below Link or Open www.acpdc.in. The Admission Procedure For Diploma Courses After 10th In Gujarat State has been started since 11th June 2018. The Admission Process Of Diploma Courses is been arranged on two websites (www.gujdiploma.nic.in & www.acpdc.in). Provisional Key Dates Of the admission process is given below with the appropriate and trusted sources. If you are little aware about this program then you probably knows that ACPDC Admission Process includes Merit Lists, Choice Filling Rounds, Seat Matrix, Mock Rounds, Fees Submission, Allotment list and all this kind of stuff. Let’s Start With The Key Dates .. ! First Year Diploma Verification Starts – 29-05-2018 -15.30 PM . Candidate’s are inform to contact nearby HELP Centre for verification. 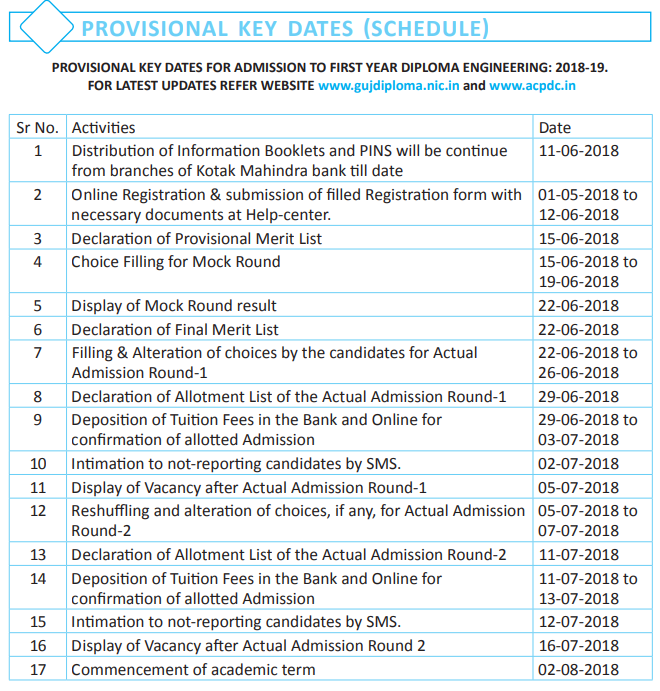 This Schedule of provisional key dates is derived from official website for diploma admission www.gujdiploma.nic.in. If you paid application fees through challan then probably you got diploma admission booklet from the kotak mahindra bank or from the help centers. This Booklet also includes the page with key dates for ACPDC Diploma admission 2018. Last Date to collect The Information booklet and PIN Was 11th June 2018 And Last Date for Online registration was 12th June 2018. Now as per the data collected by admission committee (ACPDC or Gujdiploma) They will prepare provisional merit list which will be declared on 15th June 2018. This List will be declared on www.acpdc.in on the name of ACPDC Provisional merit list 2018. On 15th June There will be another procedure candidates need to conduct. which is “Choice Filling Of Mock Round”. You can consider the mock round as the trial round of actual choice filling round. The Seat And Collages Allotted In the mock round will not be considered as final admission in diploma. You can download information booklet for gujdiploma admission from www.gujdiploma.nic.in. there are lots of sources available but we recommend you to download using below given link or using official website. To download the admission booklet follow below given steps. The Booklet will be downloaded using your browser. www.gujdiploma.nic.in is the active website for the diploma admission every year of the gujarat state. In this website candidate can fill up online form, can pay online challan/fees, Also candidates can do choice filling for both mock round and actual choice filling round for admission. gujdiploma.nic.in is very user friendly website and can easily accessible by the students who have little knowledge of internet. As per the contact us page on www.gujdiploma.nic.in, the office of ACPDC is stated on ACPC Building 2nd L D College of Engineering Ahmedabad – 380015. ACPDC Is stands for Admission committee For professional Diploma Courses (Gujarat State). This is informative website where you can find PDFs and information but you can’t do registration / choice filling and that kind of stuff. acpdc is not actively participating in the Diploma admission 2018 but you could find this website featured in booklet and news paper advertisement. provisional merit list still not show in my account..
No i cannot find it in my account can you help me to find…. And i also call on Helpline number and she has told me date has been shifted at 18 June. So if you find your merit pls help me i very tried to find. when are you going to declare merit list of 2018? i’m following the dates which are given in the booklet as well as the website is showing the same dates. its your responsibility to provide us new schedule for our conveniency. will you please reply or provide a new schedule? Yes It’s right i checked all official sites and i searched in Google too.Any sites haven’t update. I called them many times and mailed too. After lot of calls finally they received my call and said that date has been shifted.. If call is only way for declaring updates so why you provides us booklets and websites. It is your(government) responsibilities for us to provides update on websites. So i request you(government) please give update on your site and let all students know about it. They all are waits their merit since 15 june. choice failing starting yesterday . How can we check merit list online. Please show me steps for check it. ….. .when the merit list is declared then it shown on site…..
Hey friends it’s started now you can log in and fill the choice….. IF ANY ONE GETS IN ADMISSION IN THEIR 4 OR 5 CHOICE,AND THEN AVAILIBILITY IN FIRST OR SECOND CHOICE DURING SECOND ROUND.SO CAN HE/SHE CHANG IT?. For those student, who has passed ssc from other states has not shown the final merit list in his account to till now. Whether, admission will display on 29th June 2018 or outer states student eligible or not? Sir me e online fee bhari 6.pan payment recipt nathi batavti.